I love the show "Fixer Upper" and love the designs that Joanna Gaines comes up with. Some of the products are a little expensive, but when you think outside of the box, you can come up with some really cool ideas. 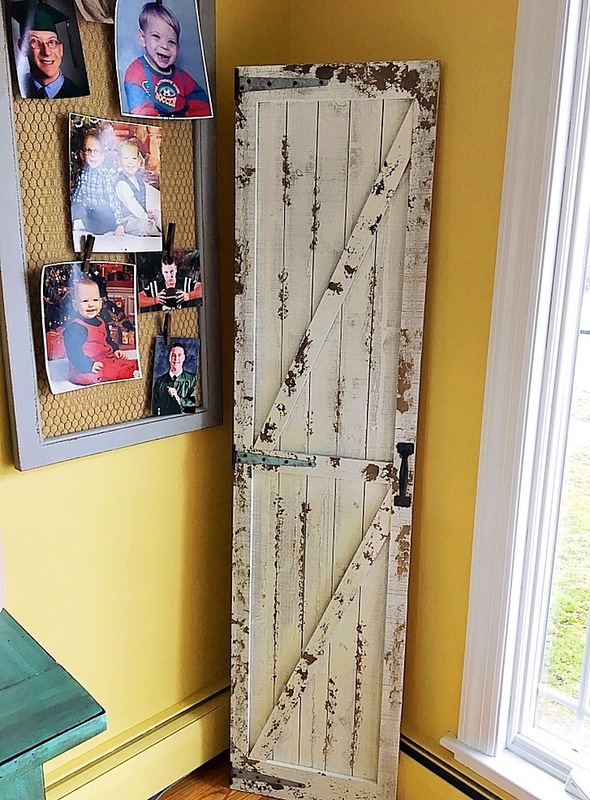 Barn doors are my thing that I have become obsessed with. My husband put them in our bedroom to get out onto our deck instead of blinds and they are fabulous. I have a little corner in the living room that looked a little bare. A large plant came to mind, but I definitely do not have a green thumb. I am lucky my kids survived. So I thought of a little barn door. I searched on Wayfair and low and behold... there it was!! And for the price of under $100.00 dollars. But with money tight sometimes, you need to look at the blank canvas a little differently. No running to those stores or websites with the big ticket prices. There is a sneaky way that I did decorate my homes without using every last cent I had. 1. Look through magazines. If you see something that pops out to you, rip the page out. 2. Make a vision board. Tack the pics you ripped out to the board. Keep the pics in sections. One corner would be the bathroom and the other would be the living room and so on and so on. 3. There are a couple of websites that I use constantly and they have never failed me. The first is Wayfair and the second one is Hayneedle. Both are owned by the same company, but rotate items on them. So, check out both! The prices are incredible and their return policy is awesome. 4. Always have a main color in the room you are decorating. Then have 2 coordinating colors to match. My living room is a light yellow and my 2 colors to go with it is light blue and tan. Since I live at the beach, I took the colors that remind of that. Decorating obscure places can be hard. You look at a bare space and have no clue what to do. But when you think outside the box, you will see what you love. Making those pieces work, means you are making a home filled with love.